This versatile storage cart is a practical addition to any room in your home and provides plenty of extra storage space. 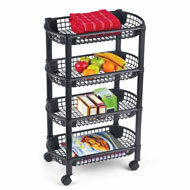 The black cart features 4 roomy baskets and smoothrolling, casterstyle wheels. 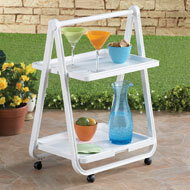 Use this cart to store pantry items in the kitchen, towels and spare toiletries in the bath or tools in the garage. Easy assembly. Each basket is 18" x 10". 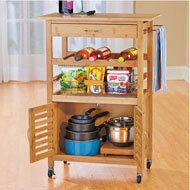 Total size is 18 1/4"L x 10 1/4"W x 29"H.
This clever rolling pantry offers versatile storage space in your home. 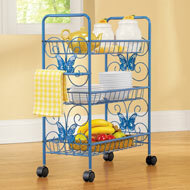 The blue metal cart features 6 shelves, smoothrolling wheels, a handle/towel rack and beautiful scrollwork on the sides accented with blue butterflies. Perfect for storing pantry items, cookbooks and more! Available in two widths. Some assembly required. Metal and plastic. Each is 24 1/2"L x 55 1/2"H. Size available in 6" Width or 10" Width. This charming shelf adds a touch of charm to your kitchen and offers versatile storage space at the same time. 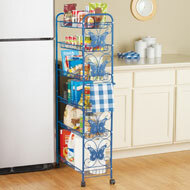 The blue metal cart features 3 tiers, smoothrolling wheels, a towel rack and features beautiful butterflies on the sides. Perfect for storing pantry items, cookbooks and more! Some assembly required. Metal.  21"L (23"L with handle/towel rack) x 10"W x 28"H.
This handy twoshelf cart is great for outdoor parties, barbecues, concerts, tailgating and more. Plus, you can use it indoors for extra storage or entertaining. With four smoothrolling wheels, it's easy to maneuver, features two spacious shelves and folds flat for compact storage. Simply wipe clean with a damp cloth. Plastic. 22 1/2"L x 15 1/3"W x 31"H.